I was recently moved to re-read this book after reading Kari Sperring's essay in Strange Horizons. I was also a fan of this series, but it has probably been 25 or 30 years since I've read any of the books. I enjoyed coming back to this book, but I was struck by how very short it was. Kurtz wastes no time getting to her story and moving it right along. It's amazing just how short it is, but perhaps works all the better for it. This is one of my faves - and I started with the Camber books. ;-) Anyway, overall, yeah! Way underrated author, and IMHO her books hold up great over time (I listened to most of the audiobooks over the past year or two). Re. the length - I never really thought about it, but it's kinda surprising how much action AND rich description she packs in. None of these 800-page doorstoppers...she knew how to put a lot into a reasonable-length book. Granted, some of the other ones are longer - but they pack in a proportional amount of stuff. I (blush) haven't read the Childe Morgan books, but the rest, except maybe King Kelson's Bride, never feel like they had any fluff or padding (and KKB didn't seem long to me - just had some slower parts than most of her books IMHO...though on a 'reread' i.e., listen to the audiobook, more happened than I remembered). I've enjoyed the two Kelson novels I've re-read a bit more than I expected to. 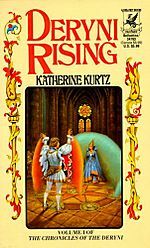 I'm a big fan of Kurtz's Deryni novels, but I'm just looking forward to getting back to the Camber books.